Heidi & Finn PlayDay Dress. I was embarrassingly impatient to get my hands on Kitschy Coo's skater dress pattern. Amanda, who does fabulous things with knits, kept teasing with photos of skater dresses she'd made for her too-cute-for-words daughter. Then there were teaser photos from pattern testers. It was almost more than I could bear. But now I finally have the pattern in hand, and it's every bit as great as I expected. 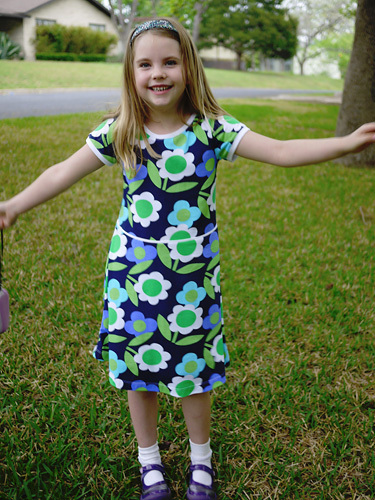 It pains me to buy a pattern that Big Sister is already at the top of size range in, but there was never any doubt that I'd buy the skater dress pattern the day it was released. After all, this is exactly the sort of comfortable and fun dress that every girl loves. And because it goes together so well, it's exactly the sort of dress sewing mamas love. I mad﻿e the size 7/8 for my big kid, and I'm relieved to say that it fits well. It's also really nice that Amanda included a line and instructions for lengthening, to help make the pattern last as long as possible. Rest assured, though, that I'll be experimenting with sizing up, because I know we'll need more skater dresses as this kid grows. Note that I made one change from the pattern. Inspired by Emmylou Bee Doo's waist detail, which looks almost like piping, I sandwiched a little band of white ribbing between the bodice and skirt. Then I stitched that white band down with a narrow zig-zag stitch so it will lay nice and flat. That fun floral jersey fabric is from Ixat, which I've mentioned over and over on this blog. Unfortunately, I'm not seeing it for sale anymore (though there are lots of great fabrics that would make lovely skater dresses). It's got a bit of a Boden look to it, doesn't it? The skater dress is a big hit. I'm not sure this kid will ever skate in the dress, so I'm thinking of renaming it the Happy Dress.